Yesterday local sources reported that the Zeynel Bey Tomb in Hasankeyf, which has been encased in a concrete foundation, has now been lifted from its original foundation. According to local reports, the tomb will be moved tomorrow (Friday) without advance notification to the press. At the time of writing, the DSI (the State Hydraulic Works), which is responsible for the Ilisu Dam Project, has not announced the move on its web site. 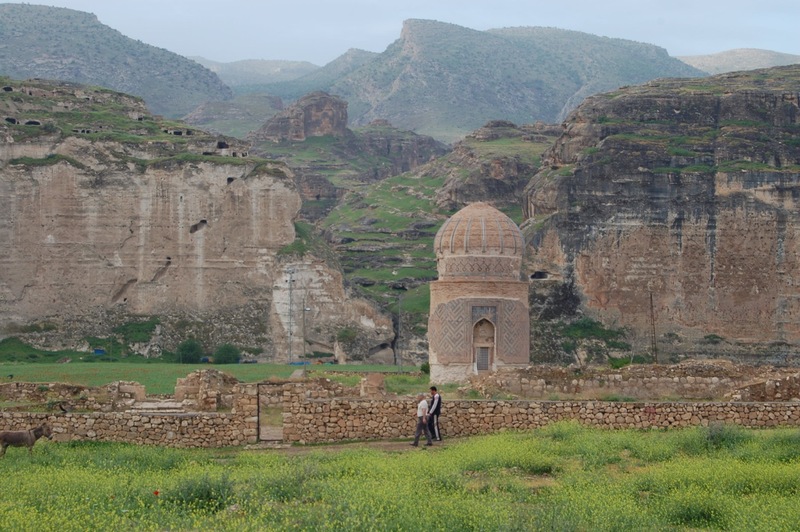 While the government claims that it is transmitting Hasankeyf’s cultural heritage to the future and transforming the town into an important tourism center for the region, they have shrouded their work in secrecy. During the decades of planning and preparation for the Ilisu project, the government has denied the local people a say in shaping the future of their town. Now the government is raising new barriers to the journalistic documentation of the changes underway in Hasankeyf. On Monday (May 8), Istanbul-based National Geographic photographer Mathias Depardon was detained while taking pictures in the new settlement area of Hasankeyf. According to news reports, after police reviewed Depardon’s social media accounts and discovered photographs shared three years ago, they arrested Depardon on suspicion of propaganda for a terrorist organization. Depardon now faces deportation, pending review of the matter by a court in Gaziantep. Depardon has visited Hasankeyf regularly for at least four years and has been working recently on a larger project for National Geographic. This incident sends a chilling message to any journalists or citizen observers seeking to document the historic changes taking place in Hasankeyf, which is set for flooding by the waters of the Ilisu Dam within two years. Security personnel in Hasankeyf have intermittently interfered with photographers who visited the new settlement area in Hasankeyf, and more recently, access to the Zeynel Bey Tomb has been restricted. The DSI has touted the relocation of the Zeynel Bey Tomb as the first time a whole building has been moved to a new location in Turkey and they predict that this will attract worldwide attention. 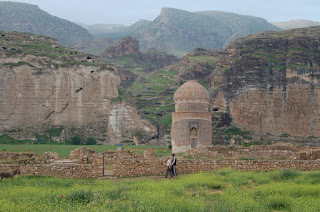 Considering the claim to transform Hasankeyf into an important tourism center for the region, the interference with the work of professional journalists to document this work and the failure to publicize the date for the actual relocation of the tomb show that Turkish authorities know that the these projects cannot withstand careful scrutiny. Indeed, the limited press coverage over the past four years shows that the project is fraught with problems. Experts considered different locations for the tomb – 1 km, 1.5 km and now 2 km from the original location – all without seeking the views of the town’s residents. For at least four years authorities have said the tomb would be moved along rails, but within recent months the plan suddenly changed and it was disclosed that the tomb would be moved on a trailer of some 150 wheels along a specially built road. Finally, authorities failed to disclose to the public the problems encountered when a test run using the new system was conducted two weeks ago. The public deserves to know and we demand that the DSI disclose why the method of relocation was changed at such a late date. We also seek full disclosure of the details of the revised plan and evidence that the revised plan has been approved in the proper way. The fact is that this project is fraught with problems – not just within the context of the controversial Ilisu Dam, which threatens the entire natural ecosystem of the Upper Tigris Basin with destruction, but also the project to relocate the Zeynel Bey Tomb. The sketchy and unstable plan threatens to destroy this invaluable manifestation of cultural heritage. The relocation of the Zeynel Bey Tomb to the new settlement area is an unforgivable and wanton act of cultural heritage destruction. This project and the whole Ilisu Project must be halted immediately. We need a new approach to building broad consensus around the socio-cultural development of Hasankeyf and the Tigris Valley. We request also the immediate release of Mathias Depardon and the liberty for each journalist and human to move in and around Hasankeyf! The destruction of Hasankeyf has far more to do with genocide than with Turkish hydropower modernization. So much trouble to remove a village filled with Kurds! Mathias Depardon must be released and given the freedom to document the last days of a truly unparalleled, millennias-old city on the Silk Road, with its absolutely unique urban form and inestimable cultural artifacts, Zeynel Bey Zawiya included. The task he sets himself can only be applauded and Turkey's efforts here deplored.